North-eastern New South Wales is the home of the Bundjalung nation. Djurra, the title of a new stage work produced by NORPA (Northern Rivers Performing Arts) and directed by Kirk Page, an Indigenous actor, physical theatre artist, dancer and choreographer, means “lore.” For Aboriginal and non-indigenous audiences, Djurra’s talented creators will conjure a Bundjalung Dreamtime creation story entwined with contemporary domestic reality. The generous sharing of culture is a hallmark of Indigenous art, but so too is communication of the pain and anger felt over a culture betrayed. Djurra features artists with considerable experience and culturally diverse backgrounds: dancer Joel Bray, a Wiradjuri man, Bundjalung dancer Sarah Bolt, actor Damion Hunter, actor James Slee, originally from Kuku Yalanji and Goa clan group lands, Lismore-based Indonesian choreographer Jade Dewi, visual artists Charlotte Hayward and Edward Horne designing set and costumes, musician and composer Ben Walsh with Mitchell King, a Yaegl Bundjalung man, and Blake Rhodes, video artist Rohan Langford and lighting designer Karl Johnson. 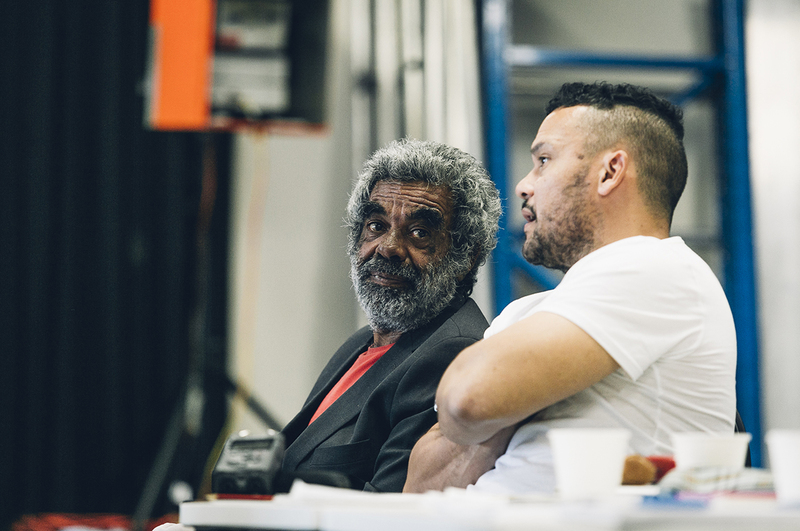 A key role has been played by cultural consultant Roy Gordon, a Bundjalung Elder, actor and teacher who began his acting career performing in Waiting for Godot, performed entirely in Bundjalung language with English subtitles, during the Festival of the Dreaming in Sydney in 1997. 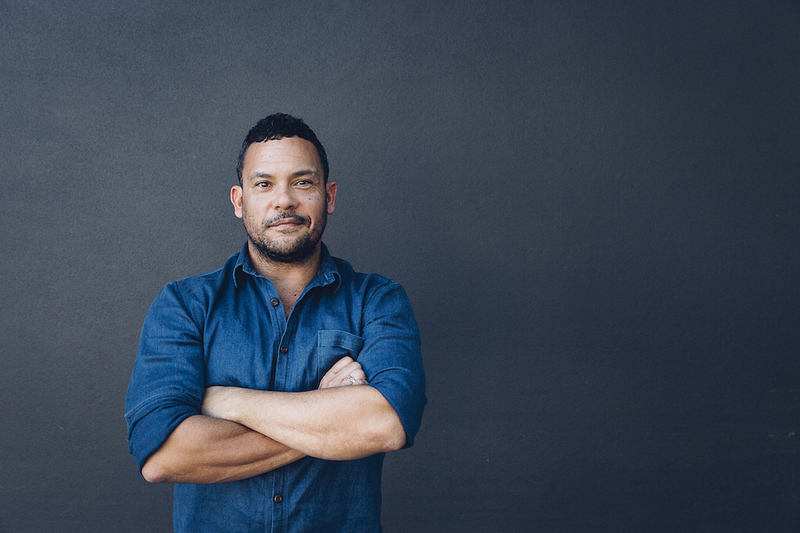 NORPA Associate Director Kirk Page is a descendant of Mulandjali people in south-east Queensland, Badu Island in the Torres Strait, Germany and Wales. His credits, spread across a 20-year career in the arts, are considerable, including acting (Redfern Now, My Place, Bran Nue Dae and Krush), movement consultation, involvement in Bangarra Dance Theatre’s Rekindling Youth Dance Program, as Assistant Director for Sydney Theatre Company’s Bloodland and My Darling Patricia’s Posts in the Paddock, and as an emerging choreographer in Force Majeure’s 2013 Cultivate program. During rehearsals for Djurra I spoke by phone with Page. He was clearly excited by the scale of the work, its cultural resonances and a distinctive collaborative process. Kirk, tell me about the cultural sources for Djurra. Djurra is inspired by a creation story from this area, from Bundjalung country. The way I’m approaching it is to create a highly visual, image-based experience of an epic dream state, a liminal space. So one line is the creation story and running through it is another line, a real-time family domestic story. In the dream story there’s the Gami [grandmother] who created the three brothers whose families eventually populate the country. The story goes that she was on the mainland — we’re not quite sure if she was grandmother or mother; there are different versions of the story — and that the brothers who can’t find her have left in their canoes. She finds she’s been left on the shore and calls out to the men. Essentially, she conjures up the waves and the wind and brings the men back. So they return home. We also found in our research a story of one of the men returning from a war at the centre of the Earth. Each of the men has experienced conflict. So we found strong themes around return — returning home and, quite simply, listening to your mother. What will your audience see and experience of this departure and return? There are moments of abstract image-making that relate to the elements — fire, water, wind. We’re also working with the men to create personas inspired by elements — wood, metal, air. Djurra’s like a contemporary dance piece with some theatrical scenes. I’m really interested in the audience feeling they’re being taken somewhere. Describe to me some of the stage action. We’ve built a rostrum on wheels that moves around the space. It provides us with a domestic space and it’s also an island — a sort of floating, liminal space. We have some rigging so there’s flying, ascending and descending. We can tip gravity off-centre and have the men function in the space where they’re not exactly upright. There are also some great scenes in which the men remember their youth; this week we’ve been looking at just what lore means and how it plays out in our lives and the extent to which we follow it. How do you dramatise something like that? At this point it’s essentially storytelling, the men recalling moments in their lives when particular things happened. Were they signs, or callings? There are ideas around listening to the environment, having that ‘bigger listening’ to the world and the Earth and the elements. How do you portray family life? The men return, appearing one by one. There’s also some really great audio and visual material. 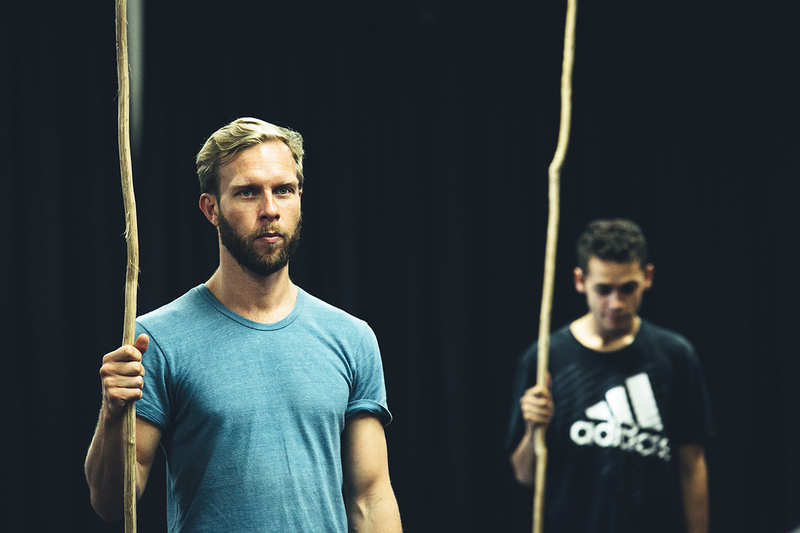 We’re signalling the elements and the men with big video moments (Rohan Langford) and some incredible sound design (Ben Walsh). Ben really wanted to create all of the sound material from the earth, on country. So he’s gone out to Evans Head and Lennox recording wind and trying to create the female whose voice is the wind. How do you represent modern life in this interplay between contemporary life and the heritage of the Dreaming? We’ve done it [in part] through the costuming. The men appear in suits. There are also scenes of death and the cycle of life. The men are returning dressed as if for a funeral. Or the suit is the colonisers’ skin or a layer of protection or a way of creating status or being accepted through the formalising of attire. You’re directing a work with a lot of elements — music, sound, video, a set designed by visual artists, and Dreamtime and dance and domestic scenes performed by two actors and two dancers. But although a choreographer you’re not credited as one for Djurra. We started with tasks and building images. Jade Dewi, a local Javanese lady who’s a contemporary dancer and choreographer, is really putting the performers through their paces and having them create personas and building on their capacities.The dancers are spectacular and I really like the way an actor’s body interprets. We’ve been getting them moving, getting them confident first and building scenes. When you say ‘personas,’ do you mean the performers are playing particular characters? Is the choreography influenced by traditional dance? These are Indigenous bodies so they interpret and have a sense of movement that is their own. Some have performed cultural dances in the past. The movement will be contemporary dance — everything from walking to being quite still to quite virtuosic. It’s not going to be beautiful, flowing movement. In the press release for Djurra, there’s mention of brokenness, eulogies and rage. How central are these ideas in a work in which you’re sharing culture with a racially mixed audience? In the black community there’s often tragedy and lots of death, whether it’s from suicide or substance abuse. We’ve tried to frame it as a metaphorical war. One man is returning from overseas where he’s been fighting a war for another country. There’s also the rage that comes from inherent anger around the position of a lot of black men in this country, whether they’re on the bottom rung or at the top. There are problematic elements for both. If you’re successful you have a voice but then there’s judgement at community level that says, “Oh, you don’t get to speak for us!” And there’s the rage about our history. That’s been a difficult thing to handle, so that we don’t just have screaming heads on stage. [LAUGHS]. We’re composing a journey through the story so it’s not just angry. But you’re definitely going to see people talk about what it feels like. What will an Indigenous audience get from Djurra? I’d really like them to see themselves onstage, to see their stories, especially the local people from this area, to see their own culture, their own history played out and having that put to the forefront on a platform that is magical and beautiful and heart-wrenching. It’s really about inviting these people into the theatre space to see a story that’s not someone else’s; it’s theirs. And what might it mean for a white audience? I’d like them to walk away with some insights and understanding about the day to day to lives of Aboriginal people and what lies beneath the rage and the hardness. And to also experience the beauty of these stories and our culture and who we are as people. So it’s celebratory as well as critical. What has making Djurra meant for you? It feels like I’ve been having my own initiation of sorts. It’s a really wonderful opportunity to have a voice and to work in an artistic realm in a way that I wouldn’t usually do. 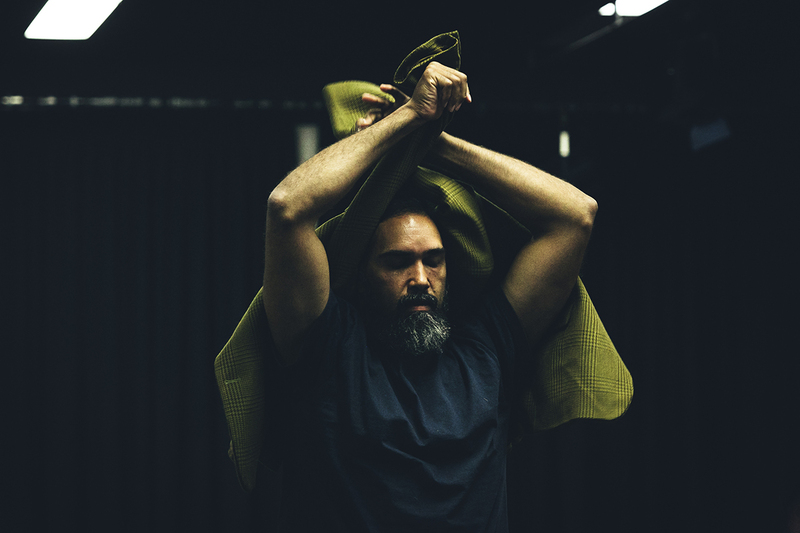 Over the years, I’ve enjoyed the experience of devising theatre and I like sharing that skill and [at the same time] sharing another way of working with Aboriginal and TSI artists.